It’s time to close this Infosec August with the list of the main cyber attacks occurred between the 16th and 31st (Part I here). Despite, in terms of mere numbers, this fortnight has shown a decreasing trend, the chronicles report several remarkable events. In particular Web.com suffered the most important breach of this second half of August, causing the compromising of 93,000 customer records. In the same period Malwarebytes unmasked two more massive malvertising campaign, whose largest one, caused by an old acquaintance like Adspirit.de, was able to distribute malware via MSN.com (in the other case, PlentyOfFish, a popular dating site, was equally abused to distribute malware). The chronicle also report another DDoS attack against GitHub. 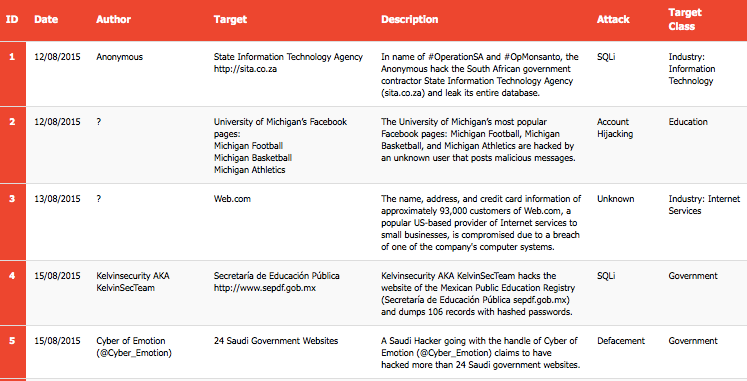 The list of targeted attacks is similarly pretty interesting: it includes Operation Watermain (a campaign targeting South East Asian Nations), Blue Termite (against Japanese targets), a bogus domain in disguise of the Electronic Frontier Foundation made up with the sole purpose to serve malware, and, last but not least, yet another campaign against Iranian dissidents. And let’s close with a quick overview of the hacktivism, whose most important event is the attack, carried on by the Anonymous collective, against the South African State Information Technology Agency. As usual, scroll down the list to have an idea of this Summer cyber landscape, and remember to keep the level of attention very high. In the same time if you want to have an idea of how fragile our electronic identity is inside the cyberspace, have a look at the timelines of the main Cyber Attacks in 2011, 2012, 2013, 2014 and now 2015 (regularly updated). You may also want to have a look at the Cyber Attack Statistics, and follow @paulsparrows on Twitter for the latest updates.